In the middle of Recovering My Couch and the disaster that my sewing room has become because of it, the most sound thing for me to do is put together a pair of True Bias’ Hudson Pants. My logic is that I have a cousin getting married next week, so I knew I’d be in the car at length, needing some comfy travel gear. I’ve been eyeing this pattern for some time now, seeing everyone’s casual and more chic versions. Rachel’s scuba version has such fantastic style. I decided to fancy up this already fun, casual pattern with some colorblocking on the legs. So, I give you, my Colorblocked Hudson Pant. 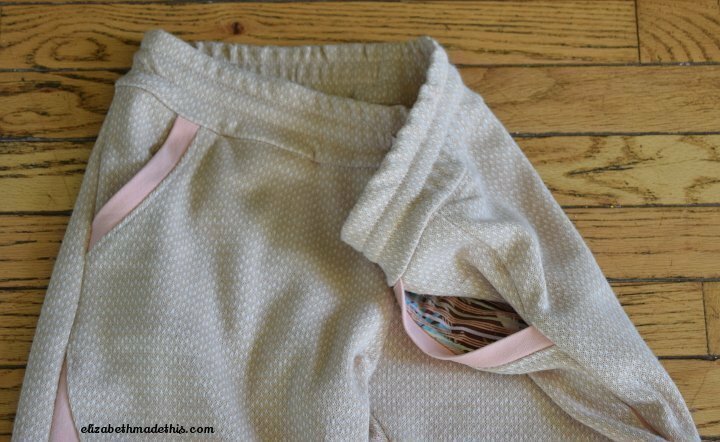 I had pinned this pair of sweats on my Pattern Meets RTW board a couple of days ago and knew it’d be a simple pattern hack. I will go into the details on another post, but suffice it to say that this hack is a high reward/low effort affair! For the main body of the pants, I used a speckled latte sweater knit leftover from my Neopolitan Drop Waist Sweater Dress. For the contrast, I chose a peach ponte from some unblogged yoga pants and a stripe knit for the cuffs and drawstring from this Spring Skirt and this Burdastyle asymmetric top. After I cut my pieces and seamed together my front pieces per my changes, I followed the pattern’s directions the rest of the way. I did stray from the directions with the construction order. The pattern has you go the route of sewing the crotch seam in the round. It works perfectly well to do it this way, I just prefer to sew everything in flat it’s possible. Instead, I sewed the fronts and backs together, then the side seams, then the inseam as one. I also used a contrast knit for the pocket facings. This cut down on bulk and let me add a little surprise leftover from my Unintentional Back Cowl. I do need to tweak the fit of this pair for my next version. I never automatically adjust for my flat rear on knit pants because sometimes the knit stretches well enough to negate the issue. But sweater and sweatshirt knits often don’t have enough recovery, so there is definitely extra fabric hanging off of me. I’d also probably prefer to have a little more shaping in the side seams–but that’s on me, not the pattern for adjusting the fit. Still, I love the casual feel of these pants and how easy they are to accessorize. 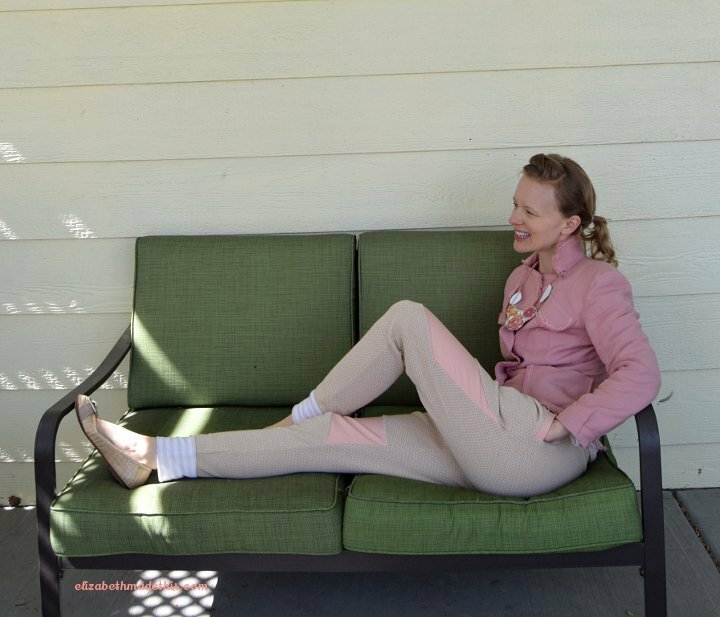 With my Linen Fringed Jacket and my favorite springy flats, my Hudsons felt downright dressy. I’m going to consider that a win, given that I finished these at 8:30 last night and I slept in them and have now gone through my whole day in them. And yes, they’re coming in the car with me next week (though I will wash them!). I have my eye on another version with my changes in some light blue velour salvaged from a beloved pair of sweatpants that are way way too big on me. 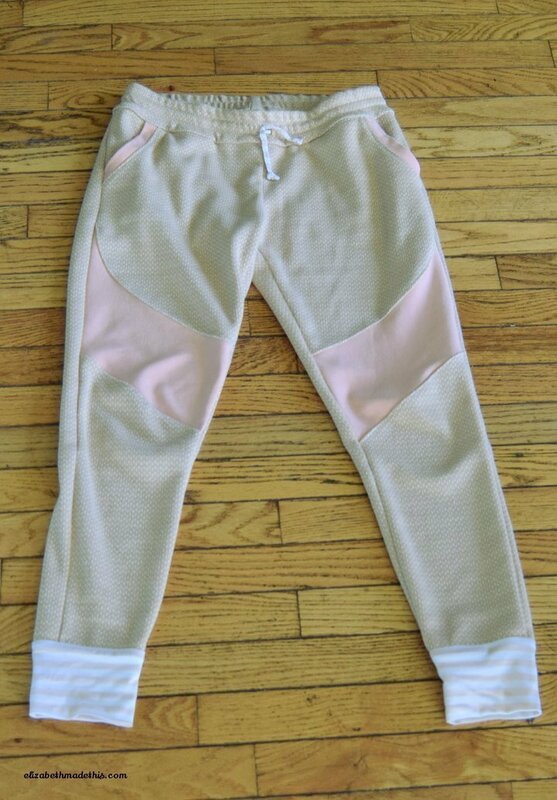 I’d love to save them and make them better, particularly since I can’t find any velour that’s as nice. 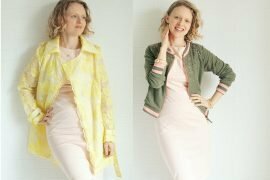 What is your favorite casual to dressy pattern? My review is here at Patternreview. And here is my review at Indie Sew. This looks great! I need to try this pattern out. It’s a good instant gratification pattern! Bonus: They look so good with that jacket that it’ll make your MMM pledge to wear more jackets easier! I hope so. I love jackets + pants! This colorblocking is fabulous! I love the curved seam! The pants look very comfortable! I love the colors too! 🙂 I think I want a pair. I love these! It makes me wish I did the same hack with a black contrast on my floral Hudsons – by the way, thanks for the shout-out! I also have a long car trip coming up and the Hudsons are perfect for it. Great idea! Now that I think about it, those pants and yours are really similar! I hope they’re comfy for you as you travel as well. I love them! They look fantastic. I have only made one pair of those and it was out of some junky fabric, and now I feel like I need to have another go. I also realized that I’m not getting emails anymore when you post new stuff. I’ve been missing out! Thanks for letting me know about the email issue. I will work on finding a solution! Ok, Bryanna, I figured it out. There’s now a nifty little email subscription sign up under the about me in the sidebar. I wish that these things had transferred when I moved the site, but alas, they did not. Again, thanks for letting me know about it!